Oh the pressure! 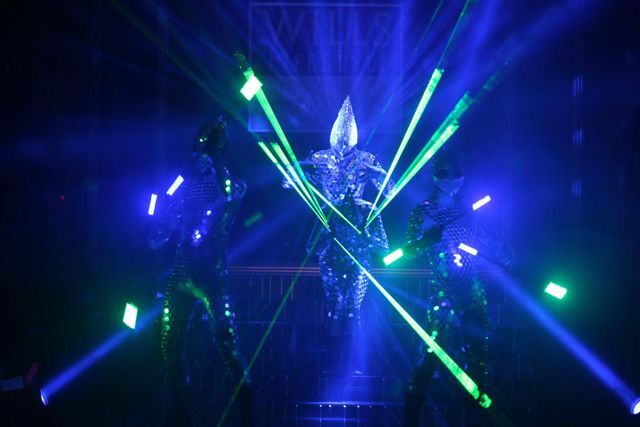 The opening and closing shows for Wills Lifestyle India Fashion Week are usually the most anticipated and highest profile. This year, the grand finale honour was granted to designer Namrata Joshipura whose signature silhouettes include red carpet gowns as well as barely there bodysuits. Two designers were inspired by Kashmir for AW 2014/15: Zubair Kirmani and Mrilnalini. It was great to see how the same inspiration can produce such different results. 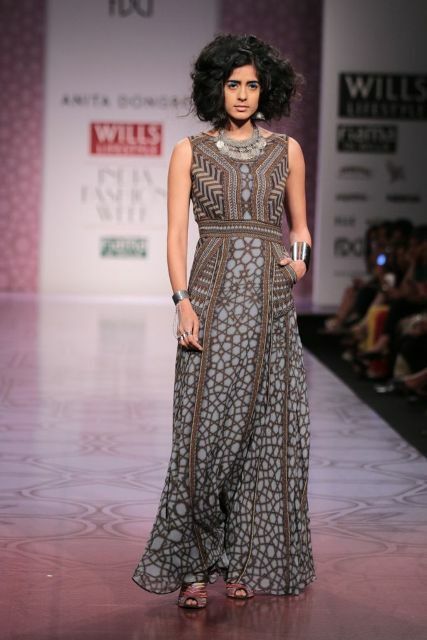 Zubair’s collection was feminine indulgence and prettiness whereas Mrilnalini had a utilitarian approach. 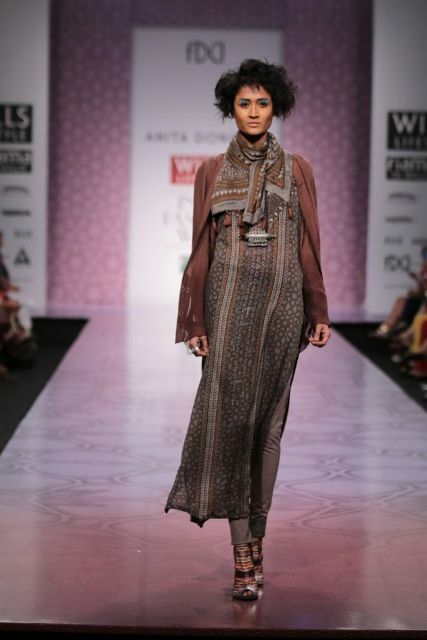 A few designers at Wills Lifestyle India Fashion Week were inspired by the concept of a free spirited bohemian, vintage loving traveller. 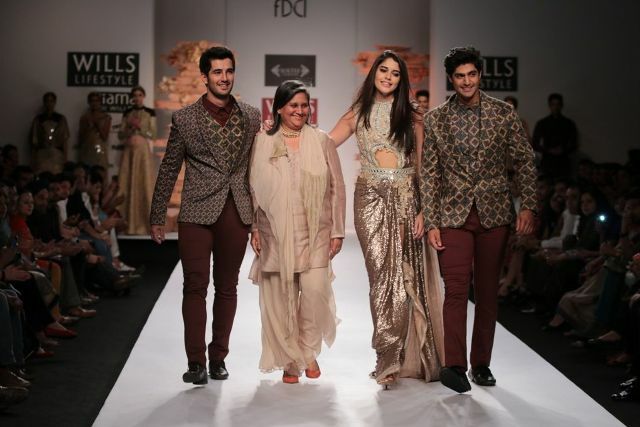 Anita Dongre’s Jaipur bride muse made Europe her playground for AW 2014. Gorgeous tousled hair, peacock eyes and tassels were the continuing thread in an altogether beautiful collection. The European reference didn’t come across as strong as the designer may have wanted as the prints and overall styling as very Indian ethnic. Perhaps the Jaipur bride decided to park herself in Andalucia? 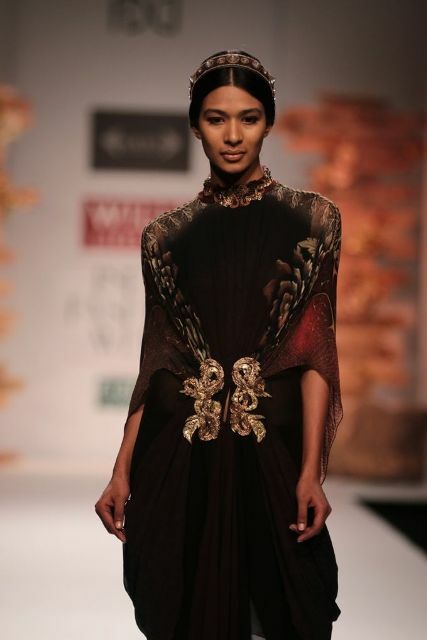 ‘Dark Gives Balance’ was the title of Soltee by Sulakshana Monga’s show for AW 2014. A collection that was dominated by nudes, browns and golden tones, the looks that were presented were glamorous and bold. Including floor sweeping gowns, menswear and flatteringly draped separates, the collection had only good times in mind. Designer Charu Prashar’s collection was full of dramatic geometric patterns and body contouring silhouettes for confident women. Cobalt blue was the predominant shade paired with black for maximum drama. 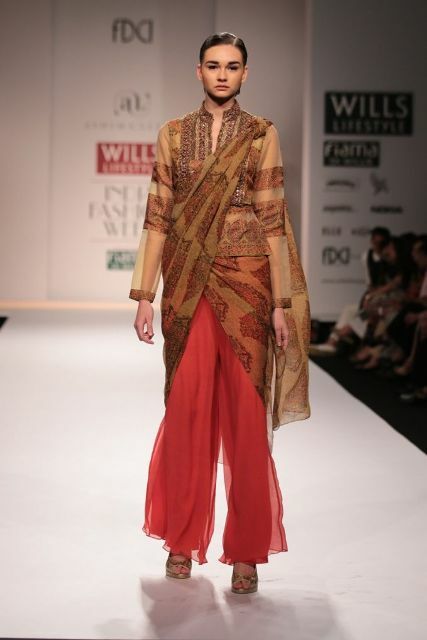 Ashima-Leena’s collection inspiration is the tried and tested journey down the old silk route. I say this not to criticise but to emphasise that it remains fertile ground and has provided centuries of ideas to creatives. 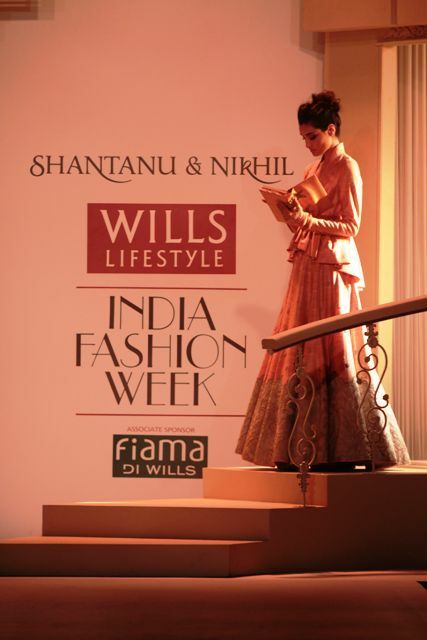 Shantanu & Nikhil are incredibly talented designers with impeccable attention to detail. Their latest collection was inspired by timeless vintage travel. The powder, blush and antique rose and apricot hues reminisced British colonial times. Lace was the dominant detail and it was especially striking on the fingerless gloves worn by all the models.